=►Clean and cut fresh fenugreek leaves. =►Heat 1 ½ tsp of oil in a pan, put cumin seeds and allow it to crack. =►When it cracks add sliced ginger, curry leaves and garlic into it. =►Saute it well and add chopped methi leaves , ¼ tsp of turmeric and cilantro into it. =►Mix it properly and cook it for 1-2min. Switch off the flame. =►Take a big bowl and put 2 ½ cup of wheat flour, salt and ½ tsp of turmeric. =►Mix everything well and add enough water to make a dough. =►Knead it well to make a soft dough (You can add little bit oil for softening). 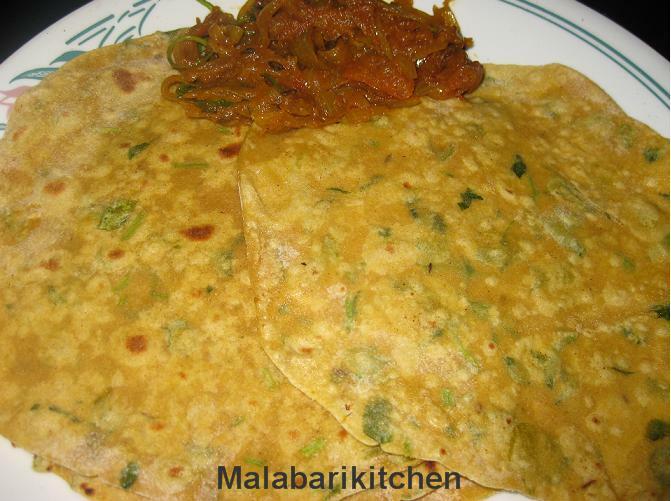 =►Make a carving in the centre of the dough and put cooked methi and cover it. =►Then again knead it well to make a smooth dough. Divide into chapathi balls. =►Press it and cook it on tawa and bursh it with ghee on top. Adipoli Chapathi, I love methi chapathi's lot.